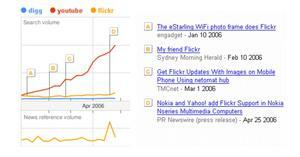 The most fascinating Web 2.0 companies for me are Wikipedia, YouTube, Flickr and Digg. I love them. So I thought I would take a look at how interested the rest of the world is in each of these star innovators and looked at the in Google Trends for this year (click here to see original search). Well, it turns out to be a one-horse race at first. Wikipedia is the most searched for by some distance. Fair enough - it has been around longer and it must also reflect its universal usefulness. Digg is a niche community, and I would read its relatively low ranking in search results as reflecting the diverse nature of people using the internet. If they were all searching for Digg, I guess the web would still belong to the tech-obsessed. Important as Digg is as a model, and love it as I do, it's not for everyone. The big story here though is YouTube's meteoric rise. I had an inkling of how many people search for YouTube because of a typo in an earlier post on Open where I called it "YouTubes". On some days 25% of my hits have come from people mis-typing the term in Google or Yahoo! (Open is number 8 at the moment). The question that needs to be asked is will this rise continue or will the YouTube backlash we've see in some quarters begin to bring it down. My gut feel is that it will continue to rise - much of the negative press is likely to be among hard-core innovator users, who will already be looking for the next big thing. YouTube meanwhile is gathering pace through early adopters and (if email circulars are any gauge) quickly grabbing the attention of early majority types, in the classic technology adoption curve model. There's lag - I don't think this brings us bang up to date. On the latter point, according to Factiva 2.0 Flickr got 520 articles written about it since February and YouTube's racked up almost 50% more (769) - but there's no Youtube articles here. my advice: if you're using Google Trends take the search terms but use a good media analysis tool (like Factiva 2.0, which is brilliant and complements the big picture, broad trends approach of Google with some of its graphs). : : Lastly, back to Wikipedia for a moment.If we take search terms as the common currency of language then the people of the world now say "Wikipedia" more than "encyclopedia". That switchover happened sometime in 2004 and now the gap between the two is huge.